One of the fun things about the toy world is seeing an old idea come back in a new form. Hasbro's Fighter Pods lasted for four series between 2011 and 2013 before being given the axe, but not before spanning all six movies and The Clone Wars. There were blind bags there were exclusives, and the whole collection could fit in a shoe box with room to spare. It was also the only line with Ziro the Hutt - I was sad to see it go. But hey, it's back! Micro Force Series 1 brings back 12 molds from those series with deco and tiny sculpt changes, with series 2 coming in a few months with characters from the newer films. I'm still putting together a set, but out of five packets I got eight different figures. And there are differences from Fighter Pods - check out most of them after the break. These tiny 1-inch-ish figures come with a 5mm hole in their bottoms, as they were originally designed to be plugged in to Fighter Pods vehicles. Those are starting to get expensive, so you can also connect them to LEGO studs or the 5mm pegs on Transformers toys if you're so inclined. Figures added new copyright and manufacture markings, These ones say "LFL HASBRO SA VIETNAM" plus a date stamp - in my case 72551 - while Fighter Pods were bare and blank bottomed. Note: The new figures have a Micro Force logo under them. Figures with no logo are classic Fighter Pods figures from our archives. Yoda has new shades of green, setting this swinging lightsaber figure apart from the release in series 4 ("Rampage.") His tan coat is lighter. The green skin is closer to the lighter variant of the 1980s Kenner figure. The lightsaber is a new shade of green. The Imperial Stormtrooper is taken from a series one figure, this time in a brighter white plastic with sharper paint applications. Han Solo returns in his Hoth gear offering a baffling (but why stop now) third redeco of his coat. Previous ones were blue and brown, and this new one is a darker blue. It fits in the middle of those two colors, but Han retains the eye stylings of the brown jacket variant. Princess Leia Organa started life as a series two Fighter Pods figure. This time around her dress is whiter and her eyes are painted differently - they're a bit more modernized, with white dots in the middle. Her lips are also pinker. The original Fighter Pods release featured eyes that were more like an old 1970s Kenner figure. A strange change is her belt - the original Fighter Pods release had a silver band around her waist, while the new Micro Force figure is only silver on the front. The back is unpainted. R2-D2 is the three-legged variant with the restraining bolt. Compared to his Fighter Pods release, the white plastic is brighter and the blue paint applications are a little but smaller and tighter - you'll see a little more exposed silver paint and white plastic here. The Protocol Droid C-3PO is a much more sparkly, vibrant gold this time around. It's an improvement. Darth Vader takes a the Sith Lord with his hand out and removes some decoration from Fighter Pods. The Micro Force version lacks some silver paint, and the chest buttons are red - no blue, no silver. A few of the black hard armor elements do seem glossier, but that could just be production variation. has slightly richer colors for Micro Force, and the stitching on his hood is left unpainted. I personally prefer the Fighter Pods version slightly, but they're different enough that I'd say it's worth tracking down both versions. There's also a Checklist Trading Card in each packet made out of a thick cardboard. It shows all 12 Series 1 figures, but there's a catch - they show the old Fighter Pods paint jobs. Any decoration changes aren't on this little catalog card, so you'll need to track down photos or samples to know the changes. 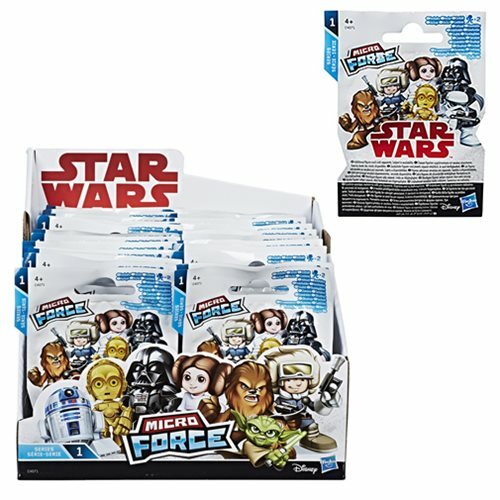 Five Micro Force sample packets provided by Hasbro's public relation team.